If you're a coffee fanatic like I am, coffee cupping is an experience I highly recommend you try. Yesterday, I had the opportunity to experience coffee cupping for the first time, sampling coffees at Stone Creek Coffee Factory in downtown Milwaukee. Cupping is a process of smelling aromas and tasting flavors of freshly ground coffee, used by professionals, like Steve Hawthorne at Stone Creek, to determine a coffee's quality. Coffee is sniffed dry, then brewed and sniffed and finally tasted, with values and notes recorded on a 1-10 scale for later review and comparison. 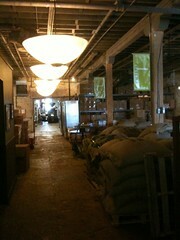 I found the Stone Creek Factory building and my cupping experience fascinating. Before cupping, Steve and Eric from Stone Creek gave us a tour of the facility to see coffee being roasted and the packaging operations in action. Cupping was quite the experience. I was surprised at the complexity of aromas and tastes in each coffee, determined by the region where it was grown. Of the 4 coffees we tried, my favorite was the smoky, chocolatey flavor and aroma of a Brazilian coffee. If you love coffee and have a chance to experience cupping, give it a try. 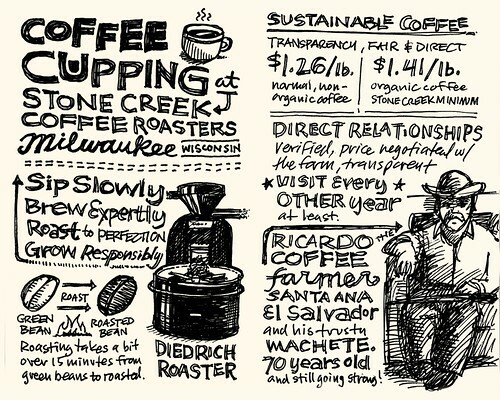 If you're in Milwaukee, Stone Creek offers a public cupping session every other Friday morning at 9am at their Factory location on 5th and St. Paul. Give them a call at (414) 270-1008 to sign up for a cupping session. 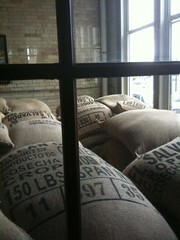 Thanks to Eric Resch, Steve Hawthorne and Melissa Perez at Stone Creek for making the coffee cupping session happen. I had a great time! 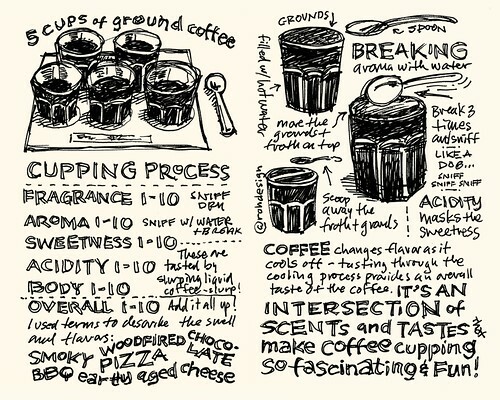 Other articles: Daily Cupo - Cupping vs French Press: What Is The Most Difference?